Yesterday while I was out pulling weeds in the backyard I came across a few plants that looked liked garlic scapes. It was weird. I couldn’t figure out what they were at first but then quickly came to the conclusion they must in fact be wild garlic. What on earth would garlic be doing among the dandelions and vining weeds? How did it get there? Is it edible? Should I pick the garlic? 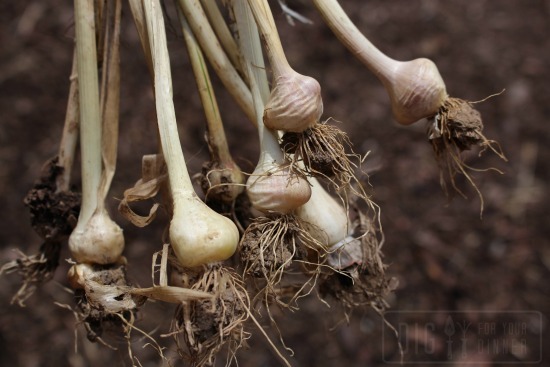 Well I did pick the garlic bulbs… and then rushed inside and did a quick google image check. 🙂 Ahh technology… it’s pretty cool sometimes. Do you have wild garlic growing in your neck of the woods? Yes!! We just moved into our new house and I wanted weed in the front. I thought they were weeds growing under our tree and I pulled one and smelled garlic! We use them in cooking 🙂 Free food is great! We have tons of garlic down the street on the roadside that I have seen in the fall when its gone to see, but I have never figured out when it was ready! I did slow down the other day on my way past, but couldn’t see anything. Now I’ll have to go look closer for it. So glad to see this! 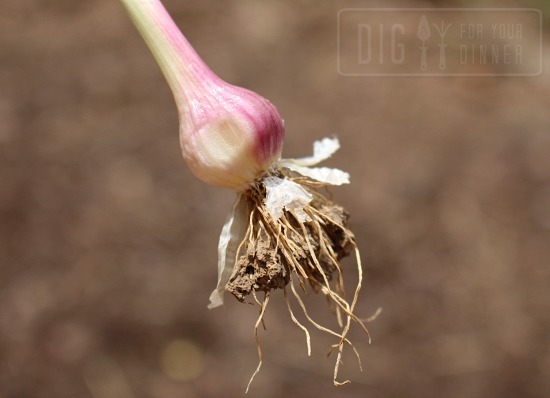 Usually garlic is ready for harvest when half the leaves are dried up. If seed stalks go up before that you should break them off at the ground, but they are also edible. I think I planted 3 tomatoes per tub. 2 towards the back and one towards the front. I just stuck a tomato cage around each one for support. A friend just gave me some of this. She called it “green garlic”. Do you still have any of the other end of the plant, to show us what they looked like? Nice find! Can you show the tops, too? I would love to see what the tops look like for this wild garlic. I wouldn’t know what to pull, I’m that unfamiliar with wild garlic. Do you have any top pics? 🙂 Thanks! Yes! We have lots here in Northeastern MA. They’re growing everywhere along trails and in fields. I usually go out foraging for them around now. 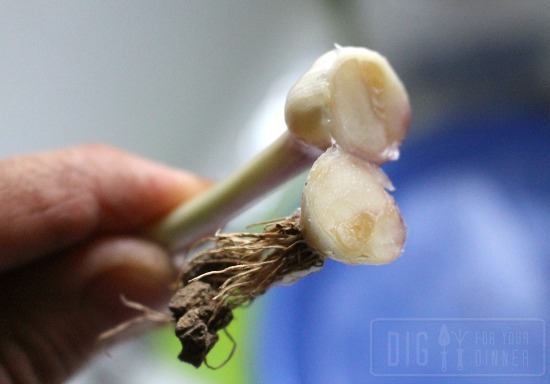 the stems can be eaten when they’re young and tender enough, along with the bulbs. Tastes great sautéed, stir fried, even in soups.